What does it really mean if the Supreme Court is shifting rightward? Of course the justices are motivated in part by ideology. 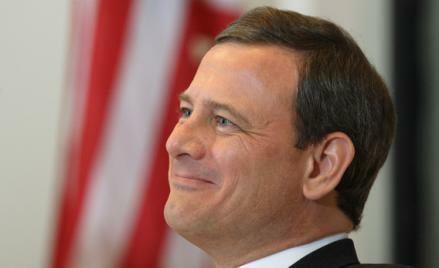 Supreme Court Chief Justice John Roberts smiles before speaking at Northwestern University Law School in Chicago on Feb. 1, 2007. Walter notes how far to the right the court has moved in recent years, and plenty of evidence backs him up. If you look at a standard ranking of justices by how conservative their votes are (and I am looking at the third column on Page 111 of The Behavior of Federal Judges, a recent book by by Lee Epstein, Bill Landes, and our Breakfast Table interlocutor Richard Posner), you will see that Thomas, Alito, Scalia, and Roberts are the second-, fourth-, fifth-, and 11th-most conservative justices since 1937. With Walter, I suspect that Alito will rise to the top when the data set is extended beyond 2009. O’Connor is No. 14, so it wouldn’t be surprising if Walter were right that her replacement with Alito moved the court further to the right. This rightward movement has been a significant source of unhappiness among liberals, and many of them accuse the conservative justices of being ideologically motivated. Now of course they are; everyone knows that Supreme Court justices are at least in part ideologically motivated. Statistical analysis by Epstein and many other political scientists and law professors have established beyond doubt that you can predict the votes of a Supreme Court justice in large part (but not completely) based on the party of the appointing president and other signals of the ideology of the justice at the time that he or she was appointed. But that, of course, means that liberal justices are ideologically motivated as well. This makes it a lot harder to criticize the current court for being out of line. The standard liberal criticism is that it (as well as its predecessor, the Rehnquist Court) has eroded precedents from the Warren Court era of the 1950s and 1960s. The Warren Court established many of the constitutional norms that we take for granted today—in areas of civil rights, privacy, voting rights, First Amendment rights, and the rights of criminal defendants, among others. But the Warren Court was even more ideologically extreme than the current court—just in the opposite direction. The table I am looking at ranks Marshall, Goldberg, Douglas, Brennan, and Fortas—Warren Court stalwarts from the 1960s—as the five most liberal justices since 1937. Warren himself was the eighth. Once we understand the Warren Court’s position in the historical record, it becomes harder to say that the current court is ideologically out of line. At a minimum, it is not sufficient criticism to say that it refuses to uphold precedents of the Warren Court, which of course ignored the precedents of its predecessors. We need some nonhistorical baseline for evaluating justices, and when we search for one, we, as much as the justices we criticize, seem to fall back on ideological priors. The upshot of all this is that we always accuse opposite-ideology justices of pursuing ideological ends while congratulating justices who share our ideological preferences for upholding the rule of law. Maybe, as Walter says, law matters, but Walter himself points out that an apparently liberal vote by Alito may mask a more sophisticated long-term ideological goal. Roberts famously voted counterideologically to uphold the Affordable Care Act, but Emily is not the only person to believe that he sought to shore up the court’s legitimacy so that he could pursue ideological ends over the long term. There are plenty of unanimous opinions and also, as the senior Posner notes, easy cases that the court does not bother to review, but then again no one thinks that people who are ideological opposites must disagree about absolutely everything, or that it would be a worthwhile use of time and resources to battle over minor issues. When a justice like Souter drifts left over the course of his career on the bench, we say that his ideology has changed, not that he has submitted to laws that he might not like. And when a justice like Kennedy or O’Connor occupies the middle, we accuse them of waffling or seeking to maximize their power over the court rather than declare them ideologically neutral. So if the law really matters for Supreme Court justices, we seem to be incapable of recognizing when it does.